This is a Track link section from German Tiger 1 Tank battlefield recovered from France.This link section with blast damage jagged edges from ware it was ripped from the Tank in an explosion this is a pin hole section of link with the hole is complete and with it is a small section of track pin the sections are rusty but still very solid are relic but have cleaned up very well and are a cracking unusual find from the battlefield.The Track link section and pin have been mounted in to a glass fronted box frame with information and pictures the frame is 15 inches by 12 inches in size. The link and pin were recovered in the Falaise Pocket in Normandy from the 1944 Summer battlefield. A nice and rare to find relic from the iconic battle of Normandy and the Death of the German 7th Army which was pretty much destroyed with the loss of 500 Tanks and Assault guns in the battle from the 12th to the 21st August 1944. Three German schwere Panzer Abteilung equipped with Tiger I tanks fought in Normandy against Allied invasion forces. In addition, a small number of Tiger I tanks may have also reached Normandy with the Panzer Lehr Division in total around 130 Tiger 1 Tanks were in Normandy. • s.SS-Pz.Abt. 101 received 45 Tiger I in deliveries in October 1943 (10), January 1944 (8 or 9), and April 1944 (25 or 26). The unit reached Normandy in early June and Michael Wittmann and the 1st and 2nd Ko. fought in the well-known battle of Villers-Bocage on June 13. The unit's Tigers included both the rubber-wheel and steel-wheel variants. Spare track was mounted on the front plate of most, but not all, of the unit's Tigers. Each Kompanie carried the distinctive unit marking of crossed keys in a shield, on the front and rear. In addition, the 1st Ko. also carried a panzer lozenge with an "S" and a small "1" on the front and rear plates. Tactical numbers were fairly large and dark with white outline, except for the command tanks. • s.SS-Pz.Abt. 102 was transferred to Normandy with 45 Tiger I, reaching action in early July. The unit was originally shipped six Tiger I in April 1944 and 39 Tiger I in May 1944. Again, photographs of the unit's Tigers are very limited. Technical features would be identical to late Tigers shipped to s.Pz.Abt. 503 and s.SS-Pz.Abt. 101. However, the unit appears not to have mounted spare track on the front plate. Camouflage was large patches of color which on some vehicles leads to the appearance of lines of the original dunkelgelb. Tactical numbers were thin, neatly stencilled with white outline and dark interior. Tactical numbers on the turret sides were often sloped, being aligned with the slope of the turret roof. Some Tigers carried a single underlined "S" rune painted on the zimmerit on the front and/or rear plates. • Panzer Lehr Division was issued ten Tiger I in September-October 1943 and five Tiger II in February-March 1944. Of the ten Tiger I, three Tiger were listed as still with the division in summer 1944. The division reported six of eight Tigers operational on June 1 and three Tigers operational on July 1. 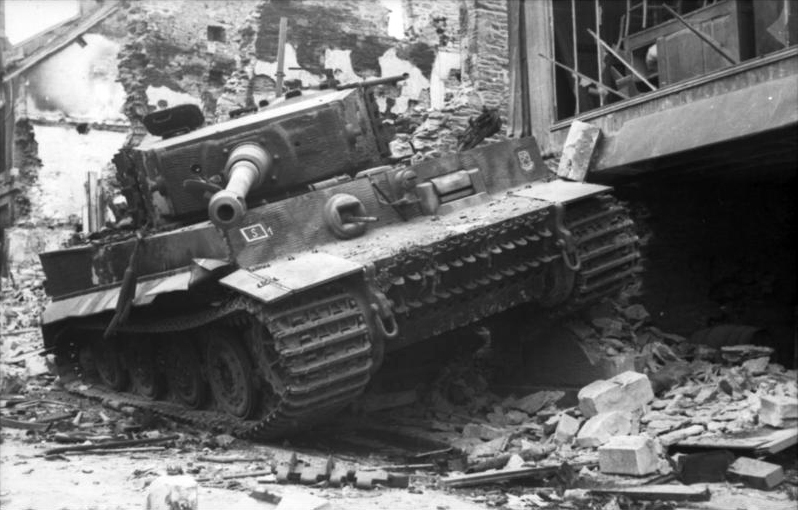 Whether any Tiger I actually travelled with the division to Normandy, and the eventual fate of the Tiger I are unknown.